To define the personage of pianist Curtis Clark as “underappreciated” is putting it a bit mild! Perhaps his indebtedness to Horace Tapscott has taught him to keep his own artistic virtues well-hidden. But that’s a sin, for a musician who appears on records like David Murray’s Murray's Steps or on Home Safely, in trio with Ernst Glerum and Han Bennink, which is still one of the more unforgettable and intense works for piano trio of the last twenty years [if you don’t know this work, you should do everything you can to find it]. 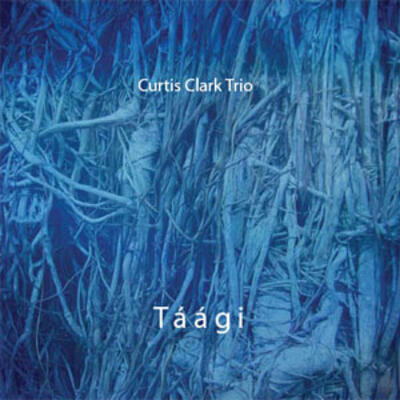 It is therefore with pleasure and curiosity that we receive Taagi, with Clark again in a cooperative trio setting - this time with the two contrasting musicians Aaron and Stefan Gonzalez, on bass and drums, respectively, both sons of the well- known trumpeter Dennis Gonzalez. The record opens with two suites, "Joy/Blessings" and "Water Colors/New York City Wildlife," in which Clark alternates solo beginnings with collective interplay in a convincing way. In his solo explorations, the pianist explores various ambiences, easily putting together the blues with harmonic complexity. But even on the rest of the record, which closes with a new reading of the standard " Beautiful Love, " there breathes an air of authentic dynamic quality, of inventiveness and balance between the different movements, without having to choose between the character of the music or the musicians, whether in the phrasing or in the total construction of the pieces. We are not sure that this record from the Lithuanian NoBusiness Records will succeed in removing from oblivion the career of pianist Curtis Clark, but this is certainly another milepost along the length of a measured career.